Businesses on the southeast corner of Yonge and Gerrard Streets have been closing up shop for the last several years. But by the end of the month, the once historic streetscape will be completely vacant, making way for one of Toronto’s largest proposed condominium developments. 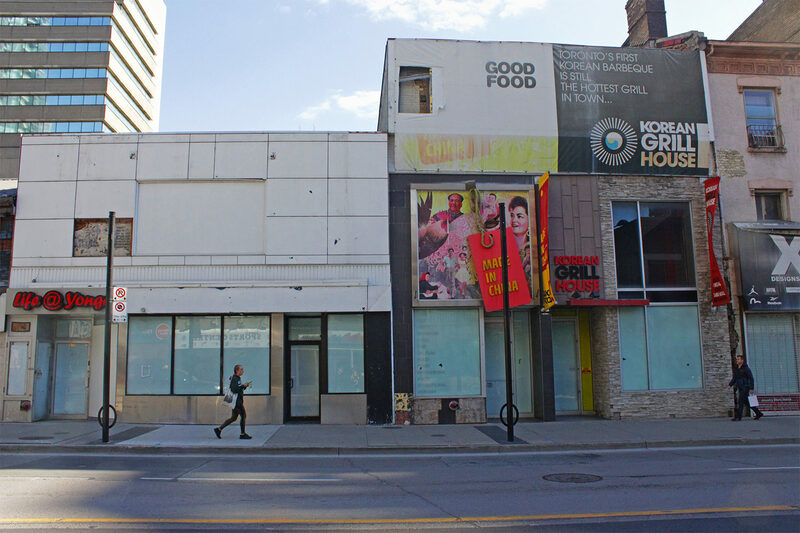 On Oct. 5, the few remaining businesses at 385 Yonge St., including the 15-year-old VIP Lounge & Billiards Club and the 17-year-old Doner Kebab House, were served eviction notices, giving them until Oct. 31 to vacate the premises. The closures, which will span south from the building on the corner of Gerrard Streetto the Richard S. Williams Block at 363 Yonge St., were a long time coming. But, the notices were abrupt, leaving businesses with little time to prepare, said Guven Celikkayn, manager of Doner Kebab House. Celikkayn and his father have managed the family-owned kebab shop — one of Toronto’s first Turkish doner restaurants — for nearly two decades. Now, they’re rushing to get out. The abrupt eviction orders haven’t just startled the remaining businesses, but have also disappointed several Ryerson students and community members who frequented the famed 100-metre stretch of Yonge Street. Former Toronto resident Matthew Ciszek took to Twitter on Tuesday to express his sadness and pay tribute to the area, which he said played a significant role in his youth. While Zanzibar won’t actually be closing, Twitter users still expressed frustration with the City of Toronto for allowing additional housing to trump landmark institutions, contributing to ongoing gentrification of the area. The impending housing, named Yonge Street Living (YSL) Residences, will stand approximately 85 storeys and nearly 300 metres tall upon completion. At least for community members, architectural sketches of the planned development show an intention to preserve several heritage storefronts on the southeast corner of Yonge and Gerrard. The project, which could become the tallest residential building in Canada, will end at 361 Yonge St., just shy of Buffet Palace and Wanda’s Bakery and Espresso Bar. While Robert Ayoub, head manager of Wanda’s, said he’s grateful to keep his business, he mentioned this wasn’t always the plan. He said the developers initially sought to purchase the entire block, north of Ryerson’s Student Learning Centre, but his landlord refused to sell. Still, the closures have impacted Wanda’s business over the last several years. Ayoub is concerned about the impending development, but he’s also optimistic. He plans to market his coffee and waffles to hopefully attract the construction crews, and once the development is finished, Ayoub notes the thousands of prospective customers who will live and work down the block. Unfortunately, Celikkayn isn’t so optimistic about his business’ future, with no plans to reopen Doner Kebab House anywhere else. While he’s upset it’s closing, Celikkayn said he’s also glad — he’s been in business a long time and said he feels it’s his time to leave. Recalling his fond memories — and some less than fond — Celikkayn hopes the development will improve the area, which was struggling in recent years as shops began to close.